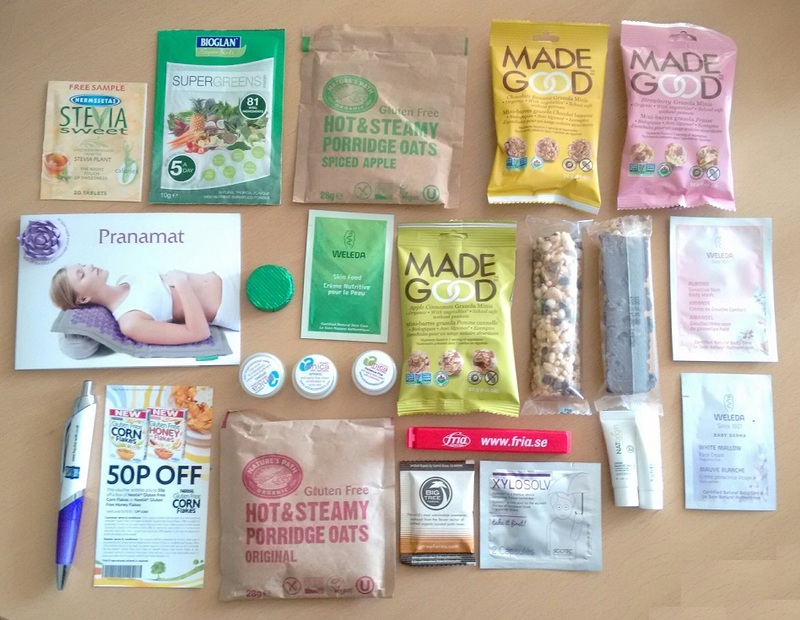 Just a few of my food and cosmetic freebies from the LNLO show. 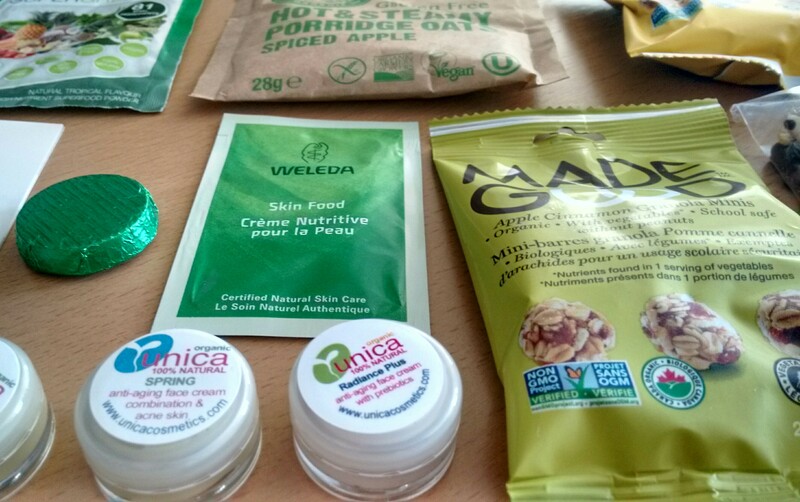 In 2014 I attended the Love Natural Love Organic show in London: a weekend-long exposition of ethical, natural and organic products. I received a bag full of freebies and ate so many free food and drink samples that I knew I couldn’t miss this year’s show. When the price is right (tickets are free and you can book as many as you like), it’s gotta be done. I rocked up at Kensington Olympia’s Grand Hall wearing flat shoes, comfy clothing and a light bag, ready to duck and weave through the crowd and pounce on freebies as they came into sight. LNLO takes place in Kensington Olympia’s Grand Hall. Well, I had a superb time. I drank samples of Weiss beer, ate organic chocolate and cake, slurped probiotic yogurt desserts, got some free pampering in the form of a creamy hand massage, tried out essential oils, creams and perfumes and filled my bag with free samples. And perhaps I ducked back to the same stalls twice or thrice just to make sure I had a really good idea of what everything smelled and tasted like. I skipped breakfast and felt no need to eat lunch. I was absolutely stuffed when I finally took my leave. …and lots of other bits and pieces besides. 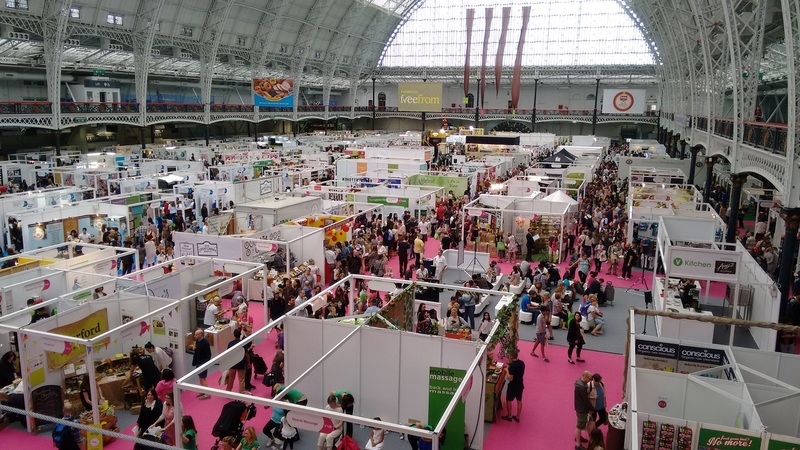 You can easily spend your time at the LNLO show without spending a single penny, but for those of you after your health food retail fix, most stalls offer a special show price on their products. New Covent Garden, for example, offered two cartons of their soup inside a cooler bag for just £2. If this sounds very much like your cup of tea, make sure you book your tickets next year. They’ll most likely be free as they have been so far. We’ll post the ticket booking link on our website nearer the time, so keep as eye out. I challenge you to see how many freebies you can come away with.